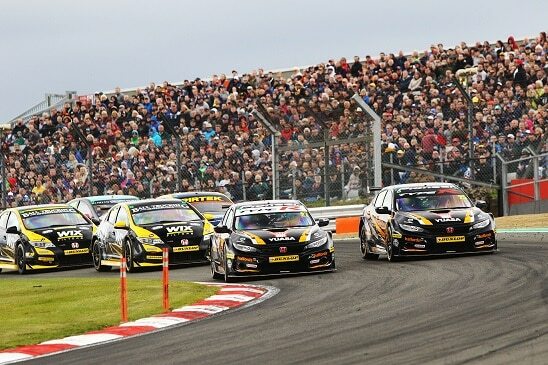 Halfords Yuasa Racing brought its 2018 Dunlop MSA British Touring Car Championship season to a spectacular conclusion at Brands Hatch as Dan Cammish twice led home Matt Neal in a pair of perfect 1-2 results to break his BTCC victory duck. On a landmark day for Halfords Yuasa Racing and the new-for-2018 Honda Civic Type R (FK8) at the culmination of the series 60th anniversary season, a peerless performance saw Cammish and Neal complete a formation finish in race once before the pair repeated the feat in race two. Qualifying on the front row, Cammish shadowed Brett Smith through the opening lap before launching his attack into Paddock Hill Bend, nosing ahead into a lead he’d retain to the chequered flag for the first win of his burgeoning BTCC career. With Neal succeeding in working his way into second place behind his team-mate, Halfords Yuasa Racing celebrated its first 1-2 of the season. With a front-row lock-out their reward in race two, Cammish and Neal shrugged off their maximum success ballast to hold position early on. From here, a tenacious Cammish skilfully negated the limitations of the weight to complete a lights-to-flag, back-to-back victory as Neal doubled the delight once more by completing another 1-2. While mid-field skirmishes contributed to Neal and Cammish finishing down the order in their final outing for 2018, it did nothing to dampen spirits as Honda and Halfords Yuasa Racing head into the off-season carrying huge momentum. Complementing his title-winning success in the Jack Sears Trophy, Cammish’s double victory multiplies Halfords Yuasa Racing’s 2018 victory tally to four, including Neal’s historic ‘Diamond Double’ success at Snetterton in July, plus two pole positions and 13 podiums. In the final drivers’ classification, a closely-matched Neal and Cammish end the season ninth and tenth respectively, with Honda sealing runners-up spot in the manufacturers’ reckoning and Halfords Yuasa Racing second in the teams’ standings. For more information on our Partners, please click here.